The pistachio crusted chicken at Sevan, a local Dallas BYOB Mediterranean restaurant, is a favorite in my dining crowd. There are many delicious entrées on the menu… but this is ALWAYS ordered. I gladly accepted the request to recreate this dish mainly so I can order a different entrée and know I won’t be deprived of my old standby favorite. I have been visiting this family run restaurant for years and they consistently turn out wonderful food. If hummus is your thing – Sevan makes super creamy hummus with just the right amount of garlic and lemon. My suggestion and another “always order” is the Muhammara. An addictive spread of roasted red bell pepper, walnuts and pomegranate molasses will keep my seat at Sevan a permanent one. In a medium saucepan, sauté garlic and onion in oil until translucent. Add tomato paste, tomatoes, water, wine, sugar, oregano and basil. Season with salt and pepper, to taste. Simmer for 20 minutes over medium low heat. Preheat oven to 350 degrees. Prepare three bowls: one containing flour to coat chicken breast, another containing the beaten egg, and the third containing chopped pistachios, breadcrumbs and oregano. Season all 3 with salt & pepper. Season the chicken on both sides with salt and pepper. 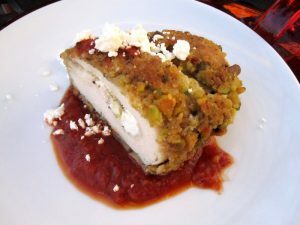 Add feta cheese, 2 teaspoons chopped pistachios and 1/2 clove minced garlic to one side of the flattened chicken breast. Fold over and secure with toothpicks to keep filling inside. Coat breast in flour, shaking off any excess. Dip chicken in egg mixture and then into the pistachio mixture. Set aside and finish breading the remaining chicken. Heat olive oil in oven safe skillet over medium heat and sear chicken for approximately 3-4 minutes on one side and then flip over. Cover with foil and place in the oven. Bake approximately 20-25 minutes or until cooked through. Serve with tomato sauce and garnish with feta. YEA! Looks so yummy – I can't wait to make this and get my Sevan fix in Austin!